The Isle Idol Stakeshooter Skin is a Limited Edition Trap Skin that was sold with the Limited Edition Isle Idol Trap. It changes the base trap's stats, power type, and area-specific effects when applied. Power: 3,750 Title Required: ?? The Isle Idol Stakeshooter Skin is Limited Edition and can no longer be acquired by Hunters. It was obtained from the Isle Idol Box Set, which was available to be purchased for 1,250,000 gold from Ronza's Traveling Shoppe during Ronza's March 2013 visit. The box could be refunded for 750,000 gold at the same location, if left unopened. 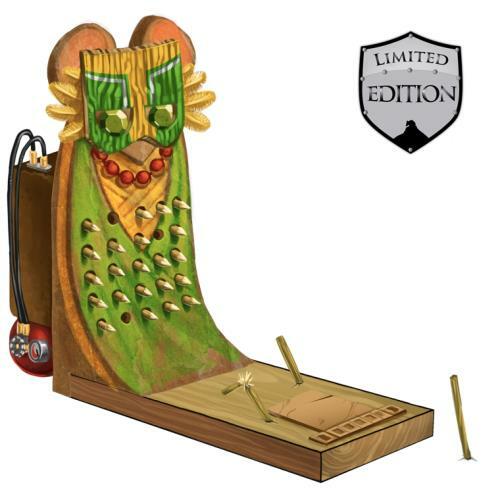 7 March 2013: The Isle Idol Stakeshooter Skin was introduced as part of MouseHunt's Fifth Birthday event.